384 pages | 9 B/W Illus. Over the last century public health efforts, such as immunization, safer food practices, public health education and promotion, improved sanitation, and water purification have been very successful in eradicating and controlling a host of diseases. The result has been a dramatic improvement in health and life expectancy. 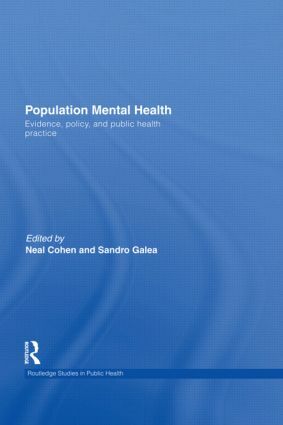 However, the impact that mental illnesses have on individuals and society as a whole has largely been overlooked by the discipline.This pioneering volume examines the evidence-base for incorporating mental health into the public health agenda by linking the available research on population mental health with public mental health policy and practice. Issues covered in the book include the influence of health and mental health policies on the care and well-being of individuals with mental illness, the interconnectedness of physical and mental disorders, the obstacles to adopting a public health orientation to mental health/mental illness, and the potential application of public health models of intervention.Setting out a unique and innovative model for integrated public mental health care, Population Mental Health identifies the tools and strategies of public health practice � surveillance and screening, early identification, preventive interventions, health promotion and community action � and their application to twenty-first century public mental health policy and practice.